PCS™ Toolset, developed by CubeIQ, is a set of utilities applicable to Prime Compliance Suite - PCS™ which automates several PCS™ day-to-day or maintenance function. Option 1, updates the CTR Amount to the whole PCS™ database customer’s table without reimporting customer data file every time the CTR Amount is updated or changed. Option 2, updates the CTR Amount directly to a specific customer record using the customer ID number and without the need to modify and save each updated customer record. It also permits to assign to a specific customer an Exemption Status according end-user decision. This is accomplished by using customer’s ID number and selecting which exemptions is required for the specific customer. In case the end-user requires updating directly another PCS™ database field then the tool can be updated to support it. PCS™ Database Direct Update is an executable which directly updates PCS database without requiring any authorization. Therefore is recommended to be used only by users that have the authority to do such changes in PCS Database. PCS™ includes 248 ready-made reports. PCS™ reports have been developed using Crystal Reports™ tool and therefore before installing PCS™, Crystal Reports™ should already be installed. All PCS™ reports have been built for usage in USA and where USA currency and date notation (MMDDYYY) are used. CubeIQ PCS™ Reporting Internationalization tool modifies these reports, either all or one-by-one, in order to present other currencies such as Euro - € and international date notation (DDMMYYYY). 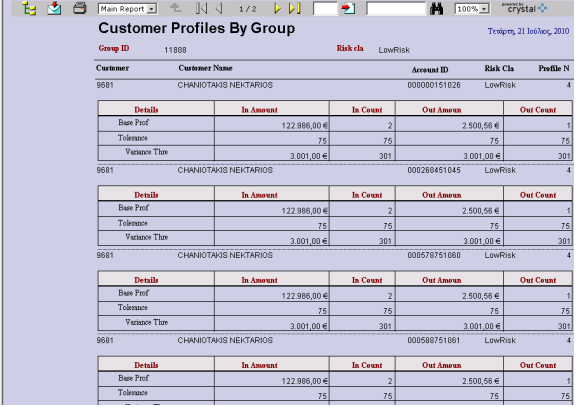 Group profiling reports tool creates consolidated reports for customers (customer ID) that belong to the same enterprise entity (each customer ID refers to the group using Parent ID field) and the enterprise has been registered as a separate customer (separate customer ID). Group Members Profiling Report presents profile details of each member (customer ID) that is part of a group (group customer ID).